In the wake of the failed attack on William Cartwright's Rawfolds Mill the authorities, newly armed with laws past by parliament, came down hard on anyone suspected of having being involved in the riots. 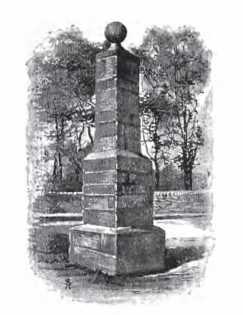 In those days it was the local Magistracy rather than the police who undertook the investigative work and Huddersfield Magistrate Joseph Radcliffe had swiftly rounded up and charged sixty four men with offences connected with the west riding disturbances who were then incarcerated at York Castle. Many of the accused had been identified by members of the public, no doubt the mill owners themselves partaking out of public duty and no doubt great zeal to settle scores arising from the events. Was charged with assembling, with diverse other persons on the night of the 11th April, and there making an attack on the Mill of Mr Cartwright, of Rawfolds and with beginning to demolish the same. This Prosecution was founded on an Act passed in the 9th year of the reign of George.III, which makes it a capital felony for any person riotously to assemble and demolish any Mill, or to begin to demolish any Mill. Mr Park, Mr Topping, and Mr Richardson, were Counsel for the Prosecutor, and Mr Raine for the Defendant. Mr Park stated the case to the Jury, in which he laid it down as the law of the case, that the violent breaking of windows, when evidently done with such instruments, and under such circumstances as shows the intent to be to demolish the building, is such a beginning to demolish as comes within the meaning of the Act. And that every person so present with the rioters giving them his countenance and aid, is as guilty in law though no individual act of violence can be personally proved against him. 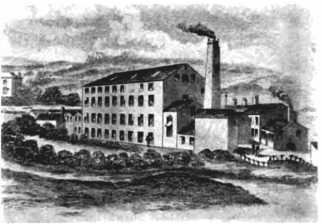 Mr Cartwright, the proprietor of the Mill, was called for the purpose of proving the riot and the nature of the attack upon the Mill. A circumstantial narrative of this having already appeared before the public, it may be sufficient merely here to add, that the attack was made 20minutes after 12 o'clock at night on the 11th April, by a considerable number of persons, but how many the darkness of the night did not give him the means of forming an opinion, the attack was made by fire-arms, hammers, mauls, and hatchets; all the windows on the side of the attack were broke in almost instantaneously, the lower windows by the instruments before mentioned, and the upper stories by discharges of ball firing and slugs. The firing continued incessantly for about 2O minutes, it was accompanied by cries of '' bang-up—damn you are you in—in with you—kill them every one.'' The party in the inside, of which the witness was one, repelled the charge by keeping up a constant fire on the assailants but the darkness of the night was such that the only guide they had in directing their fire was the flash, from the discharge of the fire-arms of the assailants. Witness supposes about 120 shots were discharged from the building, and about the same number from without. The attack continued about 20 minutes, when the assailants retired. 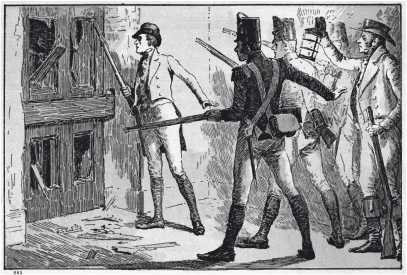 As soon as the Witness thought it prudent to open the door, he found that two wounded men had been left behind, (who afterwards died) and near the premises, in the direction in which the party had retired, a number of mauls, picklocks, masks, and bullet-moulds, were found, and which were produced in court. The wood work of the door, which was partially lined with iron, was entirely destroyed. The Witness said he had no means of forming judgment whether the Prisoner was there or not, but he had no reasons to believe he was there. The Prisoner was a person of good character and had no grounds for animosity against him. Mr Cartledge, of Brow-bridge, near Elland, said, he was returning from Wakefield, on the 22d June, accompanied by Mr Ashworth and Mr Woodhead, they called at the Black Bull, at Mirfield, for refreshment and sat in the bar, it was about eight o'clock in the evening, the, room was separated from another room by & thin wood partition in which there was a small window, the glass of which was partly broken, heard a person say in a loud tone of voice, " I was at Rawfolds on the night of the attack, I was engaged there, I was close by the two men that fell," the same voice said, that he never was in any association but one, and that was Ned or General Ludd's, (believes he used both expressions) had been in his service three years, that he had been faithful to him and would ever remain so. Witness said he spoke in a loud and boisterous tone of voice. Mr Ashworth, one of the party, went for a Constable, and the Witness went into the Room and enquired which of the party had used that language. There were eight or ten persons in the room, he was pointed out by William Clarkson, and on the return of Mr Ashworth, they prevailed on him to go with them into another room, where he denied having used the words imputed to him.—On his cross-examination he said the man appeared to have had liquor, but was not drunk; and appeared to understand what he said and what was said to him; he said Mr Cartwright knew him, and if they disputed his character he would get a letter of recommendation from him. Witness first heard of Gen. Ludd about a year ago. Witness said the Prisoner spoke so loud; that he might have been beard by every person in the low part of the house. Mr Ashworth stated the conversation at the Black Bull in these terms:—I heard a voice say, as if in answer to some person who had been contradicting him, '' but I was at Rawfolds Mill that night, and I saw the man fall'' or the men. Witness believes both expressions were used at different times. The same voice further said ''I was never engaged in any association or society in my Iife but that of General or Ned Ludd, I have ever been true to it, and I have been in it three years.'' Witness said these words were not used uninterruptedly as he had stated them, it was an interrupted conversation, and many of the expressions were repeated several times. After a consultation as to the course which it became their characters to pursue, it was determined to send for a Constable and Witness went for one, but did not succeed; on his return, the Prisoner was pointed out to him; and when he spoke he recognised the same voice; but lower and softened. Witness proceeded to state what he heard of the conversation in the room to which they retired, which was the same in substance as stated by Mr Cartledge; the Prisoner denied having used the expressions imputed to him; the Witness said he had no reason to believe that the Prisoner did not understand what he did or said; his spirits appeared to be elevated by the liquor he had taken. Nothing material occurred in his cross-examination, except that the witness, judging from the boisterous tone and manner in which the words were used, should have thought them the words of a crazy person. Wm. Clarkson (the person referred to by Mr Cartledge) stated that he was in the Black Bull public-house on the night in question, and heard the conversation, heard the prisoner say he was at Rawfolds Mill the night it was attacked, that he was engaged in the attack, and that he was near to his fellow creatures when they fell; he never had entered into any society, but he would abide by it as long as he lived. Witness said he considered the Prisoner as drunk from first to last. This finished the case on the part of the Prosecution. Mr, Joseph Savage stated that he was a surgeon at Dewsbury, and attended the Prisoner, who was very subject to attacks of fever; he attended him up to the time of Pontefract Sessions, but was then under the necessity of being absent from the 6th to the 11th of April; left him medicines; he was in a debilitated state, and not able to endure much fatigue. Judging from what he saw of the Prisoner it would have been dangerous for him to have been out on the night of the 11th of April. Witness saw him on the morning of the 12th, and, from his appearance, he should have supposed he had had his usual rest the preceding night. Mary Ward sleeps in the house of the Prisoner, who is married, and has two children. She went to bed at ten o'clock on the 11th of April, at which time the prisoner was in bed. He sleeps in the room they usually live in, Her child being unwell and restless, she got up again about eleven o'clock, and came down stairs to the fire; the Prisoner was still in bed, and spoke to her, and complained that he could get no rest. Witness soon after went to bed again, but her child continuing restless, she was under the necessity of getting up again. The clock then struck one. She remained up until near three o'clock, during which time the Prisoner frequently spoke to her, and, at the request of his wife, she gave him his medicine. The child being quiet, Prisoner advised her to go to bed, asking her what o'clock it was; she looked at the clock, and said it wanted a few minutes to three. Witness got up at six o'clock in the morning, and went to her father's house; Prisoner was still in bed. The Counsel for the Prosecution cross-examined her at considerable length, but she did not vary her testimony. She accounted for sleeping at the Prisoner's, by stating that her father had six children, and only two beds, and had not room for her and her child to sleep. His Lordship summoned up the evidence with great particularity, and observed that the riot and the beginning to demolish the mill had been clearly proved, but the material question remained, which was, whether the Prisoner was present at the attack. If he was present he was guilty. That he was present there was the evidence of his own declaration. The Jury would consider, whether under all the circumstances of the case they could be fully convinced that these declarations were founded in truth ; they would examine the manner and the circumstances under which they were made ; and from a careful consideration them, determine the degree of credit to which they were entitled. But it was right to state that these declarations, though fully proved were not confirmed by any corroborating circumstances. On the part of the defence, there was the evidence of Mr Savage, who appeared to be a respectable man, and the amount of whose testimony might fairly be stated as rendering it improbable the Prisoner should be there. If the evidence of Mary Ward had full credit given to it, and there was nothing improbable or inconsistent in the account she gave, and her evidence had not been shaken by the cross-examination. If her testimony was believed, they must of necessity acquit the prisoner, as it was impossible he could have been there. The Jury would weigh all the circumstances of the case, and if upon the whole, they were convinced that the Prisoner's declaration at the public house was true, they would find him guilty; but if they believed it was not true or had a reasonable doubt upon the subject, they would acquit him. The Jury, without leaving the box, found the prisoner—-NOT GUILTY. The verdict was received in perfect silence. It may be proper here to add, that the most perfect order and decorum prevailed in the Court during the whole of the trials for rioting; and there is in the city no military parade, nor anything to indicate that the County is not in a state of the most profound tranquillity and security.